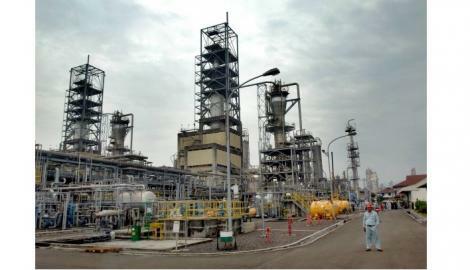 ExxonMobil has made history in Singapore by being first to launch chemical unit that processes crude oil. This will make a more direct process in taking crude into petrochemicals; and this efficiency could see ExxonMobil streak ahead in the market. ExxonMobil officially launched the world’s first chemical unit that processes crude oil in Singapore, aiming to lower costs to better compete with rivals in a market saddled with excess capacity. Chemical companies typically process refined oil products such as naphtha – created by separating crude oil into lighter groups – at facilites called crackers to create petrochemicals like ethylene and propylene. These are further processed into products such as plastics, soaps or synthetic fibres. But Exxon’s new cracker in Singapore allows the company to bypass the refining process by processing crude directly into petrochemicals. “This is the right place to do crude cracking because it gives us an advantage over the predominant feedstock in the region,” ExxonMobil Chemical’s president Stephen Pryor told Reuters. The new technology helps reduce raw material costs, energy consumption and carbon emissions, Pryor said, while the cracker also produces fuel components. He declined to detail the extent of Exxon’s savings or specify which crude grades are processed at the cracker. The cost of Brent crude is more than $160 a tonne lower than Asia’s naphtha NAF-1H-TYO, Reuters data showed. Crackers in Asia typically use naphtha as a feedstock, while those in the Middle East enjoy a cost advantage as they process cheaper ethane and propane gases into petrochemicals. The multi-billion dollar complex on Singapore’s Jurong Island includes the 1 million tonne per year (tpy) steam cracker as well as production of at least 1.4 million tpy of polymers and elastomers. The cracker was brought online in the middle of last year, but Exxon has not previously confirmed the use of crude as a feedstock. The project had been delayed for two years due to its complexity and a weak economic outlook which has pared the use of petrochemicals in automobile parts, electrical appliances and consumables, despite excess capacity. An improved economic outlook in the United States and better demand in China is expected to raise global chemical demand growth in coming years, according to the American Chemistry Council. The Council sees headline global petrochemicals growth of 4.1 percent in 2014 and 4.5 percent in 2015, up from 2.1 percent last year, said Thomas Kevin Swift, its chief economist and managing director. Global chemical demand for primary petrochemicals was expected to grow by about 50 percent over the next decade, with China accounting for half of the growth, he added. To meet this demand, Exxon also planned to raise ethylene capacity at its joint venture with Saudi Aramco and Sinopec in southern China Fujian by 200,000 tonnes per year in 2015. At the Singapore plant, Exxon could also produce specialty petrochemicals such as butyl rubber for tyres and premium resins for adhesives, Pryor said. Yet, supply from the United States could jump as petrochemical producers, including Exxon, launch projects to take advantage of cheap ethane gas from the shale resources boom. Exxon plans to build a 1.5 million tpy ethylene complex at Baytown, Texas by 2016. “Demand will grow but it will be a competitive marketplace from a standpoint of capacity and that means that marginal liquid crackers are going to be under a lot of pressure,” Pryor said. French oil major Total and Ineos have said they will shut loss-making petrochemical plants in France and Scotland as Europe readies for a competitive assault from U.S. rivals armed with cheap feedstock. Thailand-based PTT Global Chemical Public Company Limited, the chemical flagship of the giant PTT Group, signed an agreement on Tuesday with state-owned PT Pertamina on a joint venture to develop a petrochemical complex in Plaju, South Sumatra. Under the agreement, Pertamina will hold a 51 percent stake while PTT Global Chemical will have the remaining 49 percent. “PTT Global Chemical may find another partner with the consent of Pertamina,” Pertamina director Chrisna Damayanto said after the signing of the agreement on Tuesday. The companies will jointly develop the petrochemical complex on a 450-hectare-site in Plaju that will house, among other facilities, a naphtha cracker with a production capacity of 1 million tons per year, Chrisna said. The recent rapid expansion of the US natural gas sector is edging European producers out of the market and forcing them to focus increasingly on speciality products to stay afloat. With the cheaper US produce, European businesses and operations will have to be creative and focusing downstream. The US shale gas revolution is forcing a redoubling of efforts by European chemical producers to move away from low-margin petrochemicals and focus on higher margin speciality products. European petrochemical makers risk being squeezed between low-cost producers in the Middle East and a resurgent chemicals industry in the US, where feedstock and energy prices have plummeted following shale gas discoveries. After a decade of almost zero capacity expansion in US petrochemicals, shale gas has prompted the likes of Dow Chemical, LyondellBasell, Chevron Phillips and ExxonMobil Chemical to invest billions of dollars in ethane cracker capacity on the US Gulf Coast. Fresh US supplies of petrochemicals – primarily ethylene derivatives such as polyethylene and PVC – will hit global export markets in coming years. Meanwhile, Middle Eastern chemical companies that have long had a big feedstock and energy cost advantage over Europe may struggle to export to a more competitive US and seek European customers instead. Environmental concerns and greater population density have so far prevented Europe developing its own shale gas reserves, which threatens to leave European chemical producers at a competitive disadvantage in the near term. Natural gas prices in the US are roughly a third of the Europe price. In Europe, petrochemical companies tend to run costly, crude oil-derived naphtha crackers. Although some economists believe that crude oil and natural gas spreads will eventually narrow, US companies are cashing in. Bernstein Research estimates that the combination of high oil prices and cheap gas has boosted the profits of US chemical companies running ethane crackers by an annual $6bn, or roughly 14 per cent of the entire US industry’s profits in 2011. Paul Hodges, chairman of industry consultancy International eChem, says there is “a real fight to the death going on in core [petrochemical] export markets such as PVC between US and European producers”. Standard & Poor’s says European producers would “need to respond to this change in industry dynamics with a range of decisive measures aimed at improving production efficiency and improving their cost positions”. Belgian-based Solvay is dealing with US competition and weak demand in Europe’s polyvinyl chloride (PVC) market by folding its PVC assets into a joint venture with those of rival Ineos. Solvay plans to exit the agreement in a few years. Germany’s Lanxess is set to cut 1,000 jobs by the end of 2015 in response to a fall in demand for synthetic rubber from the automotive industry. About 40 per cent of the company’s sales are linked to the automotive and tyre industries. However, the rise of Middle East and Asian rivals over the past decade long ago convinced European chemical companies that they cannot succeed in commodity chemicals. That triggered years of restructuring and careful portfolio management that continues to this day to counter the challenge from Chinese companies that are striving to make more complex intermediates rather than just basic chemicals. “Most have moved downstream in Europe to protect their position. They’re moving into speciality areas which are much more technology and customer focused,” says Anton Ticktin, partner at Valence Group, the specialist chemicals advisory firm. In an example of such customer focus, BASF recently struck a partnership with Adidas to supply special foams with a unique particle structure that helps a running shoe absorb impact and give it spring. Kurt Bock, chief executive of Germany’s BASF, believes the world’s biggest chemical maker by sales will remain competitive in spite of shale developments as it has largely exited ethylene-based chemicals. Still, European chemical producers know they cannot ignore developments in the US and all insist Europe must do something about its competitive position in energy or risk investments going elsewhere. Energy costs can account for more than half of the production costs of chemical companies. Ineos’ ChlorVinyls plant in Runcorn, for example, uses as much power as the neighbouring city of Liverpool. Tata Chemicals in October said it would shut a soda ash plant in Northwich in the UK, with the loss of 220 jobs after energy prices more than doubled in the past few years. BASF is converting a naphtha cracker in Port Arthur, US to run on ethane. Meanwhile, Linde, the German industrial gases company, is to invest $200m at a site in Texas to create the world’s largest natural gas based gasification complex for syngas chemicals. Moreover, the jury is still out on whether the huge expansion of US chemical production will pay dividends in the long term. “My outlook for European chemical industry is not terribly depressed as I don’t believe there is any sound fundamental reason for the divergence between natural gas and crude oil prices,” Mr Hodges, the consultant, said. KPMG is obviously excited about the prospect of petrochemical development in Qatar, making some bold projections. While there is potential, meetings do not always lead to projects. The argument encouraging downstream manufacturing in Qatar and the Middle East is good and can be realistically put into action. DOHA: Qatar has greater petrochemical expansion plans than any other country in the region over the next 5-10 years and is well positioned for success, a global team of chemicals experts said ahead of their two-day visit to Qatar to meet with CEOs and CFOs of leading petrochemical companies in Qatar and discuss key issues facing this industry. Paul Harnick, COO of KPMG’s global chemicals practice, based in the US remarked: “Qatar is taking good steps to continue their success in the petrochemical industry and is responding to potential threats from the international marketplace. As US producers are now benefitting from low cost shale gas as a feedstock, it will make the US the cheapest place in the world to manufacture petrochemicals. “There are already several interesting developments taking place in Qatar. Firstly, Qatar is planning to set up some SME’s based on the byproducts produced by the existing petrochemical plants which will further boost the industry here. Secondly, Qatar has started to market petrochemicals through a separate entity, ‘Muntajat’, which aims to improve the prices fetched by the petrochemical companies in the international marketplace”, Gopal added. KPMG works with many of the top petrochemical companies in Qatar and the Middle East to provide strategic advice across their core functions of audit, tax and advisory services.